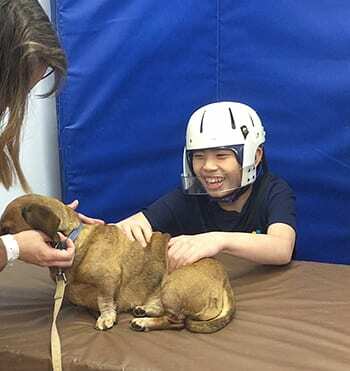 With a little bit of modification – and the help of a real dog named Kimmy – students at PALS Autism School in East Vancouver learned about how to safely interact with dogs at a recent BC SPCA Bite Free presentation. While the BC SPCA makes more than 100 Bite Free presentations in schools across the province each year, the presentation was adjusted and the students were prepared in advance, to help make the experience as visual and fun as possible. PALS Autism Shool provides programs for adults as well as students from Kindergarten through Grade 12, using scientifically validated instruction based on the principles of Applied Behavioural Analysis to improve socially significant behaviour, Kasunic notes. For BC SPCA regional humane education coordinator Jeanine Jaramillo, that meant adjusting the regular Bite Free presentation to be much more visual, with more photos and images, and fewer words. Kasunic says it was great exposure for all students, and, due to its success, she hope the BC SPCA might one day, return for a repeat performance. 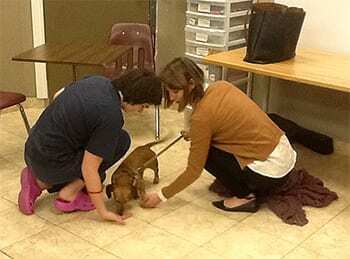 “All the classes enjoyed it, and they learned valuable information about animal safety, too. For the students to maintain this new skill, it would be great to have the BC SPCA return, with perhaps a different dog, so the students can generalize what they learned to other dogs and animals,” she says. Photos: PALS Autism School student Jordan Lee pets Kimmy (top); student Casey Maltman, left, pets Kimmy with BC SPCA regional humane education coordinator Jeanine Jaramillo.